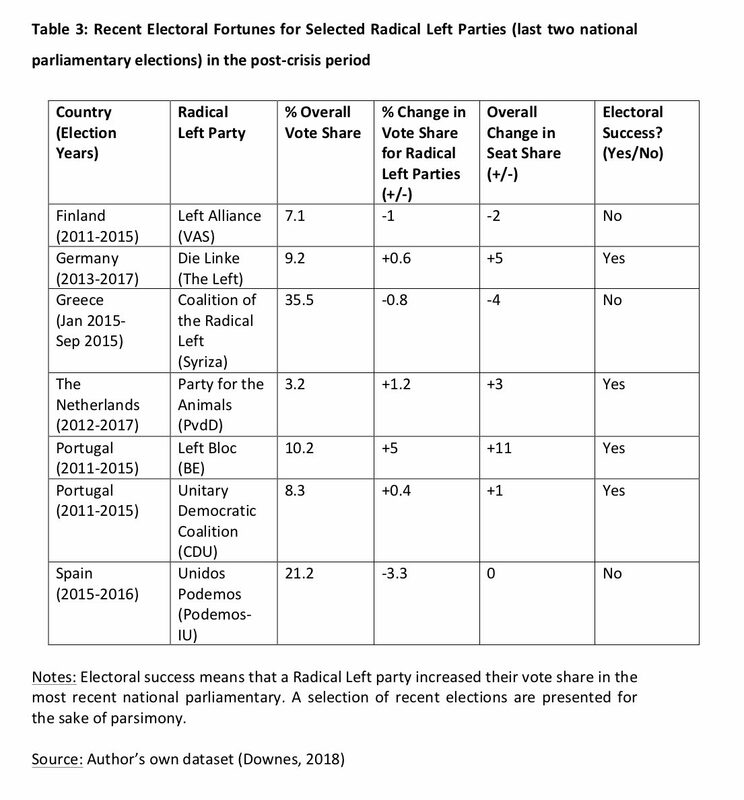 Contemporary Radical Right parties have tended to outperform Radical Left parties electorally in Europe, particularly in national parliamentary (legislative) elections during the post-economic crisis period. However, it is not clear why this is the case. Given the context of growing dissatisfaction towards the democratic establishment in which contemporary populism developed, which key factors can explain why the radical right are better able to “capitalize” on populism compared to the Radical Left, in terms of electoral success at the ballot box in Europe? 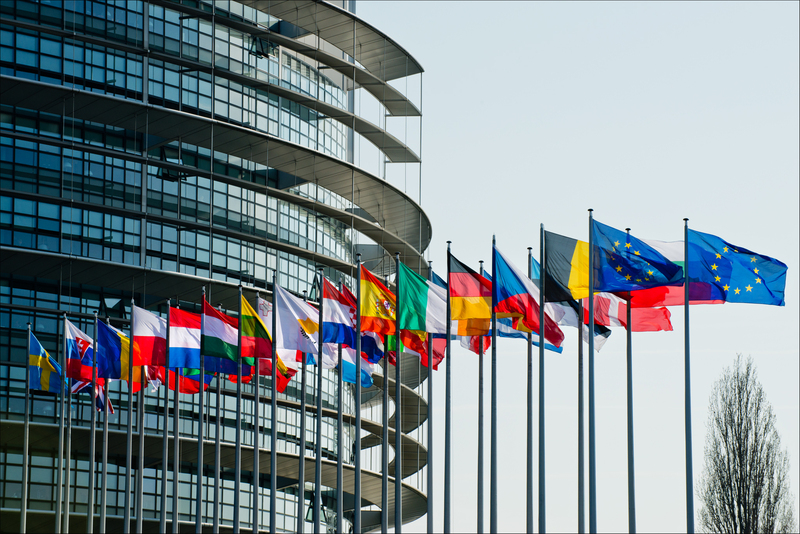 Populism is at the centre of the contemporary political debate in European politics. Since the Eurozone crisis (2008-2013), the landmark Brexit vote in 2016, the election of Trump as United States President and the ongoing refugee crisis in the European Union, the topic has been continuously mentioned by the mainstream media. The term “populism” has been used to label a number of recent political events; with the issue appearing on the agenda of major regional and international conferences. However, the modern-day term of ‘populism’ is an abstract concept, lacking a clear analytical definition. One of the world’s leading experts on populism, Cas Mudde, has defined populism as a “thin” ideology, in being easily adaptable to multiple socio-political contexts and highly heterogenous in terms of its core political features. Populism has a wide range of political issues, most notably: ranging from pseudo-socialist characteristics (current Polish government) to extreme-right xenophobic propaganda (President Donald Trump and Lega Nord) an environmentalist focus (Movimento Cinque Stelle) to overly nationalistic positions (Front National) and fight corruption (Mexico’s Lopez Obrador). It is important to provide some clear definitions of what can be considered as “Radical Right” and “Radical Left”, in order to better highlight in what ways these two-party families differ. The current political spectrum in Western and Central-Eastern European politics is blurred. For example, in Italy, the Movimento Cinque Stelle (Five Star Movement) peculiarly combines Radical Right components (fighting for preserving national sovereignty, strong criticism for soft migration policies) with strong Radical Left elements, particularly on the socio-economic dimension, such as opposition to the disrupting social effects of globalization, de facto resulting in centrism populism. One of the leading scholars on the radical right, Cas Mudde has noted that there are three core features that sets apart the Radical Right party family from Centre Right, Centre Left and Radical Left parties. The first feature of the populist Radical Right party family is a nativist ideology, where ethnocentric ideals and values are espoused which border on nationalistic and xenophobic sentiment. For radical right parties, nativism is about preserving the importance of a dominant ethnic in-group, over an out-group such as immigrants. The second feature of the radical right family, which is shared by populism, is the advancement of a dichotomoous view that divides society into two groups: a homogenous and an antagonistic group. The homogenous group are the ‘pure people’, whilst the antagonistic group are seen as the corrupt political elite, or political establishment. The third feature that sets the contemporary Radical Right family apart from other contemporary party families in Europe is its authoritarian ideology, with these parties displaying a strong emphasis on law and order throughout society. The Radical Left is diverse and there are a number of different definitions in the literature. Recently, research has suggested that there is a general consensus in the core features that make up the Radical Left. Generally speaking, Far-left parties encompass two main subtypes; ‘Radical’ Left and ‘extreme’ Left. They are not merely on the ‘left’ of social democracy and are clearly distinct. Notably, while the Radical Left tends to support forms of direct democracy, the extreme Left denounces liberal democracy. According to scholars such as March and Mudde, Radical Left is ‘Left’ in its identification of economic inequality as the basis of existing political and social arrangements and call for economic and social rights as its core principle agenda. Moreover, it is ‘radical’ in that it proposes deep-rooted change to the socio-economic structure of contemporary capitalism that involves redistribution of resources from existing political elites. Radical Left is internationalist in terms of its focus on cross-national networking and solidarity, and in its aim to put themselves in the vanguard of opposition to globalization, neo-liberalism and imperialism. 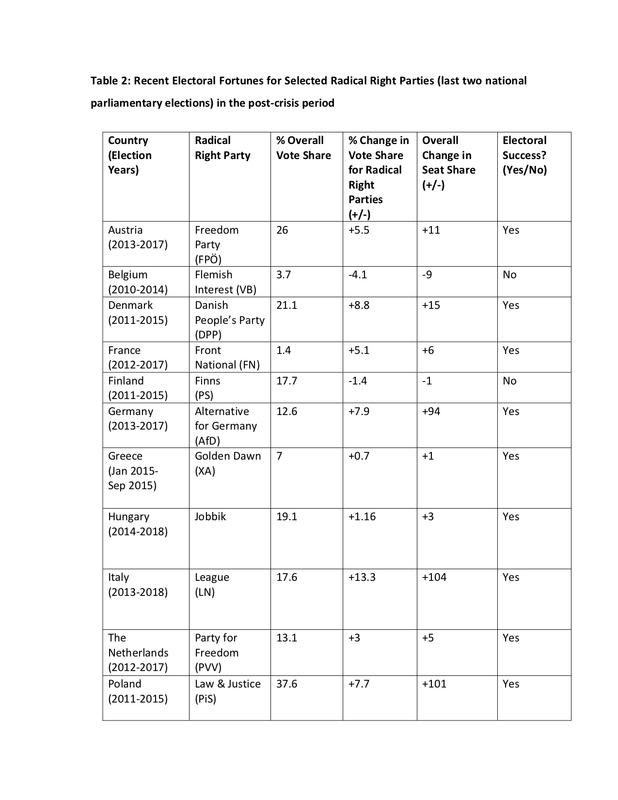 Figure 1 depicts the percentage vote share change for different types of political parties in the last two national parliamentary elections across the European Union in 28-member states. This demonstrates that in the last two national parliamentary elections that fall across the recent refugee crisis period, the Radical Right performed the best electorally. 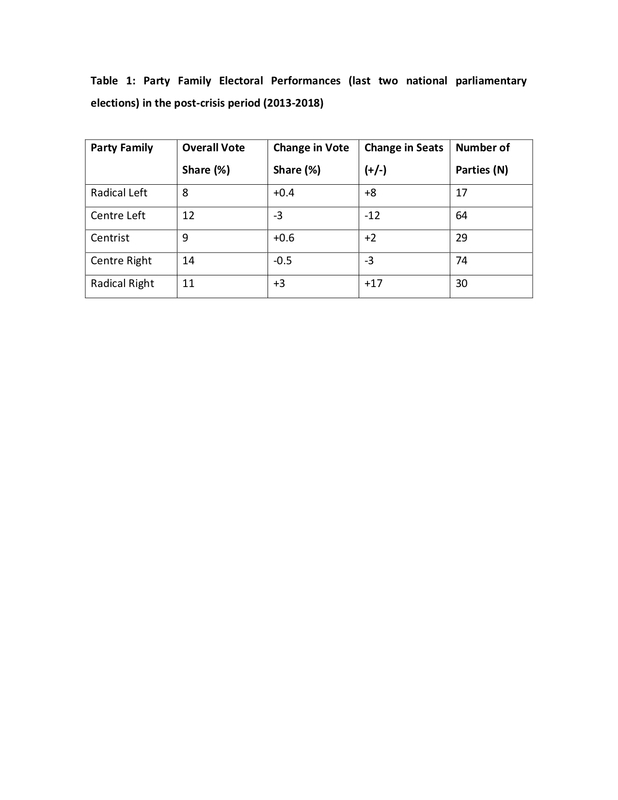 Mainstream centre left parties performed the worst electorally and further depicts the electoral downfall of this party family in the post-economic crisis period and wider anti-incumbency effects. 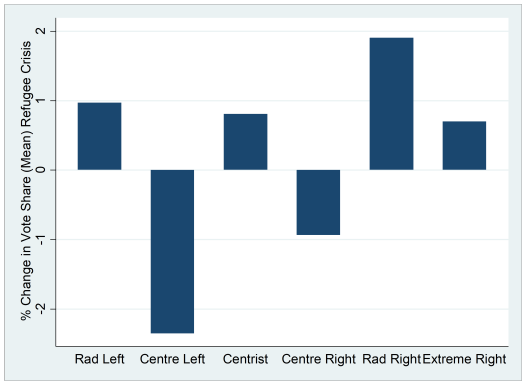 Whilst Radical Left parties performed well electorally, their electoral performance was considerably lower than Radical Right parties. The Tables further demonstrate these patterns at the comparative level, with a strong electoral performance for Radical Right parties. 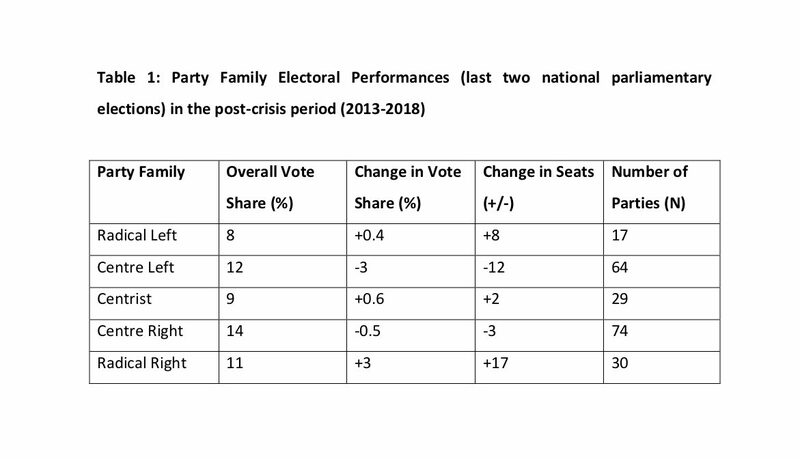 Radical Right parties not only increased their seat share but achieved a high percentage vote share (11%) points, which is not far behind that of centre left parties (12%) and centre right parties (14%). In contrast, the overall percentage vote share of Radical Left parties (8%) is considerably lower than that of the Radical Right. These aggregate level empirical findings also conceivably point to how the Radical Right and to a lesser extent the mainstream Centre Right are likely to be benefiting from playing up the immigration issue in their party strategies to voters. 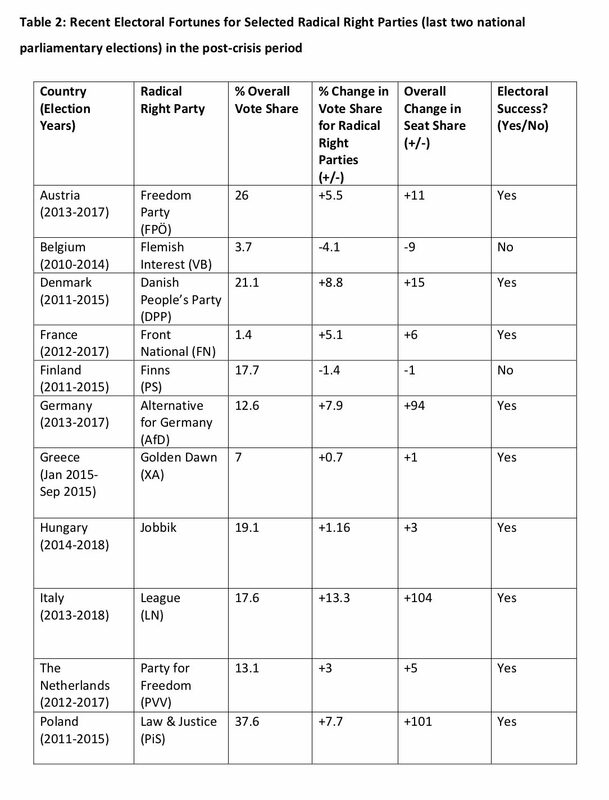 Furthermore, the data below demonstrates the electoral ‘rise’ of Radical Right parties across Europe, with the Radical Right performing particularly well in ten EU countries. In particular, the Radical Right has performed considerably well electorally from the ongoing refugee crisis context that has dominated recent national parliamentary elections. The 2017 Austrian, 2017 German and 2018 Italian legislative elections in particular demonstrate the ‘political earthquake’ that Radical Right parties have created in a number of European countries. The electoral success of the Radical Right should not be downplayed. The Austrian legislative election also saw the Freedom Party of Austria Freedom Party (FPÖ) entering into coalition with the centre right Austrian People’s Party Freedom Party (ÖVP). At the same time, the landmark 2018 Italian legislative election saw two ‘populist’ parties, in particular the Radical Right League (Lega Nord) entering into coalition government with the Five Star Movement. That said, number of Radical Left parties did perform better electorally in national parliamentary elections. Notable cases include the Left Bloc (BE) in Portugal, Die Linke (The Left) in Germany, alongside the Party for the Animals (PvdD). At the same time, cases such as Syriza (36%) in Greece and Podemos (21%) in Spain show that the Radical Left has managed to achieve a high degree of electoral success in both countries. For example, Podemos formed a leftist alliance with the former Communist Party (United Left) in June 2016, yet they failed to build on their momentum which earned them 21% of the total vote share in 2015. The newly formed alliance could not overtake the Socialist Party as the largest party among the left in Spain. Syriza suffered a hiccup in the snap election in September 2015, when their vote share declined, arguably as a result of accepting a new EU bail-out package. Nonetheless, they were still able to remain the incumbent party. However, it is important to note that electoral success for the Radical Left is not uniform, with some parties faring less well electorally and overall the Radical Left has not performed nearly as well as Radical Right parties have. Electoral Success: How to explain the victory of Radical Right Parties in Europe? The data demonstrates the ability of Radical Right parties to take advantage of the post-crisis context difficult context in Europe. A number of factors can explain the electoral success of Radical Right parties in the post-economic crisis period and how they have been able to capitalize from ‘populist’ elements and outperform their Left counterparts. 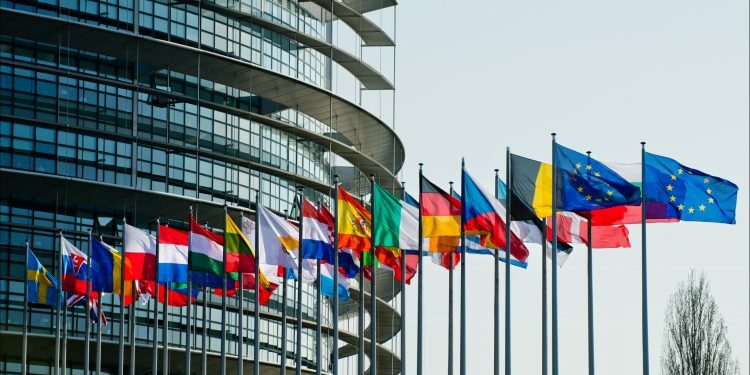 Firstly, the party strategy of the Radical Right is simple and clear, in focusing on issues such as immigration and linking this directly to general discontent and dissatisfaction with the EU. This is likely to have proved an electorally successful party strategy amongst voters. Secondly and linked to the immigration issue, the Radical Right arguably has a much broader voter to target than Radical Left parties have. Recent research has also shown that Radical Right parties have the ability to steal traditional working-class voters away from Centre Left parties, primarily due to their effective use of the immigration issue. Other research has shown that certain ‘types’ of Centre Right parties will also seek to compete with the Radical Right on key issues such as immigration, which the Radical Left and Centre Right parties have tended to downplay. A key element leading Radical Right parties to electoral success was their ability to manufacture a simple and clear message, through vivid and concrete images, thus gathering strong popular and electoral consensus in Europe. A message appealing to simple and irrationals feelings, evoking vivid images such as the “People”, the “Nation”, the “Land”, the “Borders”. At the same time, the trivialization of key socio-economic and political issues arguably granted the Radical Right electoral success over their Left counterparts, but also, in some cases, proved to be extremely successful against Centre Left and to a lesser extent Centre Right parties (see the cases of Italy, Hungary, Austria). A second and linked element lies in the capacity of the Radical Right to evoke fears on key issues such as immigration. Capitalizing over these fears, as noted by Bruno, proved to be an electorally successful party strategy: targeting the “Immigrant”, the “Capitalist”, the “Conspiracy” of the technocrats, and is likely to have boosted the Radical Right’s electoral fortunes. The “accessibility” of the Radical Right parties’ simple political messages arguably proved to be one of the key factors in outperforming the Radical Left in Europe. In contrast, the Radical Left can still largely be seen as a platform for abstract intellectual debates, incapable of reducing political complexity to easy-to-access slogan and messages, useful in our digital age. In addition, the case can be made that Radical Left parties may have been too similar ideologically to Social Democratic parties (who suffered the most electorally in the post-economic crisis period). Furthermore, the Radical Left’s incapacity to produce real political responses to the global economic crisis and to voters arguably did not help their cause. In comparison to Radical Right parties, the Radical Left was not able to weave together a clear and simple narrative, for instance on economics and at the same time have not tended to focus on the key socio-cultural issue dimension of immigration that can reap electoral success. Thus, this is likely to have been a key reason why the Radical Left has not been able to achieve a decisive electoral breakthrough in the post-economic crisis period as Radical Right parties have been able to. In conclusion, we argue that Radical Right parties were better able to offer a simple and clear ‘populist’ message on key issues such as immigration and the EU compared to the Radical Left and cut across well with disaffected voters. The Radical Right was able to use fear, and this translated into electoral success. In contrast, European Radical Left parties were likely penalized by their proximity to mainstream centre left parties. The Radical Left’s incapacity to produce real political responses (see the case of Syriza in Greece) to the economic crisis and to voters arguably did not help their cause. Dr. Valerio Alfonso Bruno holds a Ph.D. in “Institutions and Policies” from the Università Cattolica del Sacro Cuore of Milan (2017) and was doctoral researcher at the University of Fribourg, Switzerland (2015). He is Member of AREF, Association to Renew the teaching and research of Economics and Finance. He was trained at the Israel-Italy Chamber of Commerce and Industry in Tel Aviv, the European Commission in Brussels and the ITU of the United Nations in Geneva. He has published in several international journals, including Social Europe and the Georgetown Journal of International Affairs. Dr. James F. Downes is a Lecturer in Comparative Politics in the Department of Government and Public Administration at the Chinese University of Hong Kong. He is an Affiliated Visiting Research Fellow (Honorary) at the Europe Asia Policy Centre for Comparative Research. He is also a Data Advisor for the Local Democracy Dashboard project, based at the London School of Economics. He has published in journals such as Electoral Studies, in edited book volumes such as Routledge, the Contemporary China Series, LSE European Politics and Policy, alongside Social Europe and Democratic Audit.